New Year, New You, New Job. Along with all the other resolutions to improve body and mind, another thing we consider is a change of career. Career changes to improve mental health or achieve lofty aspirations are pretty common in the New Year. According to Indeed, the number of British people looking for a new job swelled by 64% last January. The increase in January job ads is largely due to the slump in December with recruitment hitting an all year low in before Christmas. January can be the perfect time to get a star employee in a transition phase. Gone are the days that say you must start and end your career with the same employer. Most people will find themselves changing jobs an average of 11 times. Changing jobs can be for the sake of a career change or an opportunity to earn more. A survey by Careerbuilder found that 45% of employees plan to stay with their employer for less than 2 years. So, now that you know that the New Year offers a larger than normal pool of potential employees, how can you effectively reach them? Well, out-of-home (OOH) advertising can be a really effective way of targeting your audience with a smaller budget than you’d think. It also allows you to narrow in on specific areas to reach your intended market with the minimum of wastage. You don’t have to leave effective recruitment advertising to the major players, a bit of creativity will go a long way. You want to attract the best and brightest, whether you work in a recruitment agency or as part of a company hiring internally. Great employees are a company’s greatest resource. 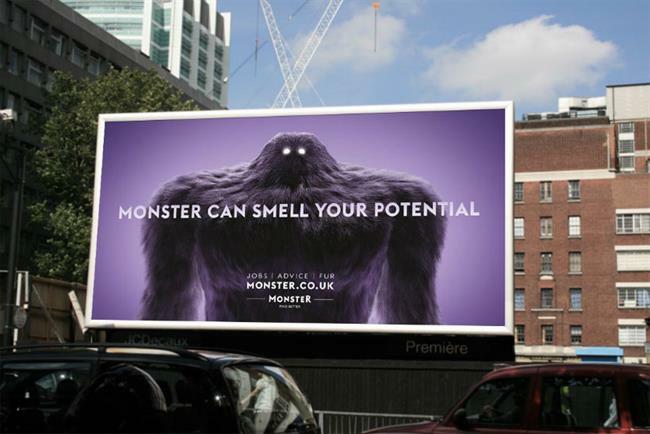 Job site Monster has certainly embraced the power of OOH advertising by launching one of its biggest campaigns in years. Their campaign aims to combat the common refrain heard by most new graduates seeking employment – “You need more experience”. Monster has addressed this by effectively targeting that audience as ‘the future’ of companies. In order to target the millennial audience the campaign aims at, Monster embraced the power of Social Media. In particular, SnapChat was used to dramatise the company’s Monster character. The campaign utilised outdoor spots across London and Edinburgh, including 400 buses for two weeks during the height of the campaign. With access to over 80,000 national OOH advertising spaces with Bubble, your company has the ability to integrate consumer and location-based marketing messages. OOH offers the opportunity to reach the right audience, with highly personalised content in locations your ideal customer frequents. Based on results from Exterion Media’s outdoor advertising survey, 74% of respondents expect to see big brands in outdoor advertising. Why? Because OOH is one of the most impactful media channels that engage with consumers throughout their day. In 2017, OOH was in the top three growing media channels. With new advancements in augmented reality and facial recognition, the growth will only continue. Consumers spend around 70% of their waking time outside of their home. Take that, then add in New Year sales, restless commuters hitting silly season celebrations and time off work spent travelling to friends and family and you’ve found a captive audience for your recruitment messaging. Utilising OOH advertising is the first smart move to your New Year resolution recruitment drive. But, OOH can be just one branch of your overarching campaign strategy. Outdoor is the perfect medium to support a radio, TV or print campaign to make the most of the time of year. The key is getting on top of your requirements to ensure you leave enough time to secure the perfect position for your campaign. You should be ahead of the curve so that your drive to recruit the best and brightest doesn’t come across as reactive. Like any good campaign, building brand awareness and good news stories about your organisations attract customers – it’s the same with recruitment. Ready to start booking your space for the New Year? This article will walk you through the steps to secure your space so you can make the most of your recruitment OOH advertising in the New Year.